Materials: Black plastic base, cast iron counterweight. Transformer 220 volt/ 12 volt inside. “fly curtain” style plastic ribbon, reinforced with metal inside. Black plastic lampshade, aluminium reflector. Porcelain halogen socket. 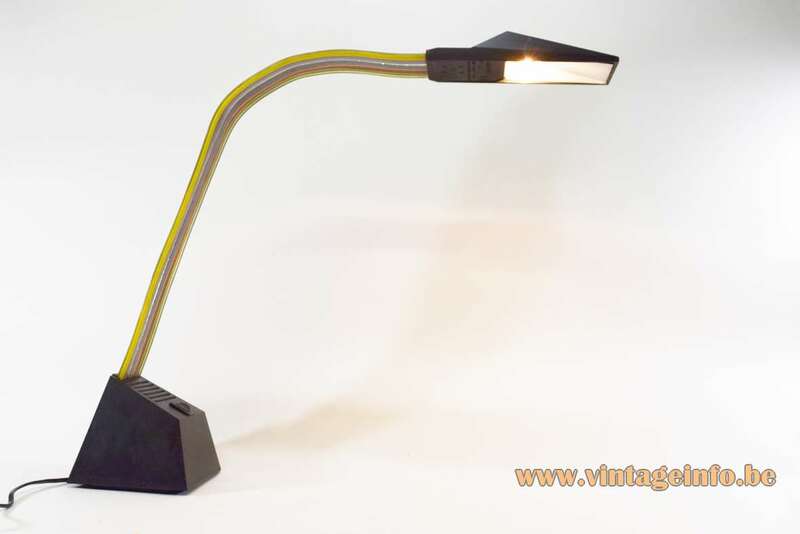 Electricity: 1 bulb G5 halogen, 1 x 50 watt maximum, 12 volt. 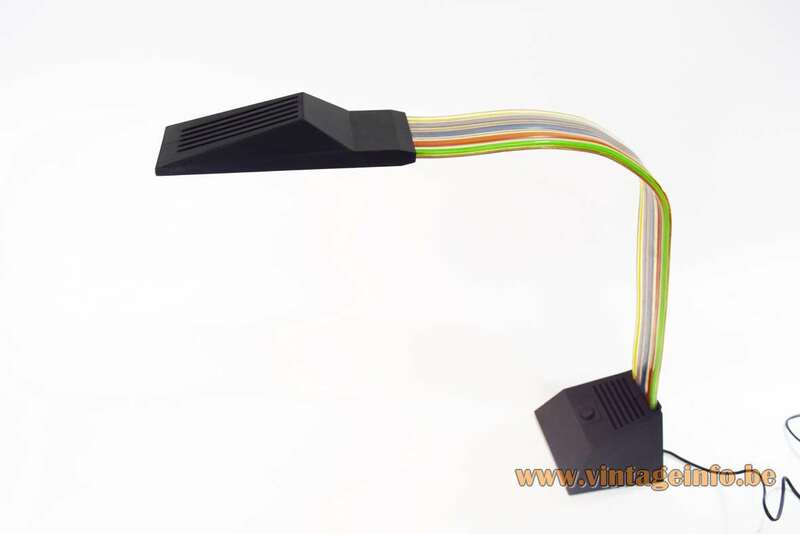 Any type of G5 lamp can be used. Not a specific one preferred. The transformer has two circuits: 12 and 6 volt. The button can switch between both voltages: the bulb can burn at half force. 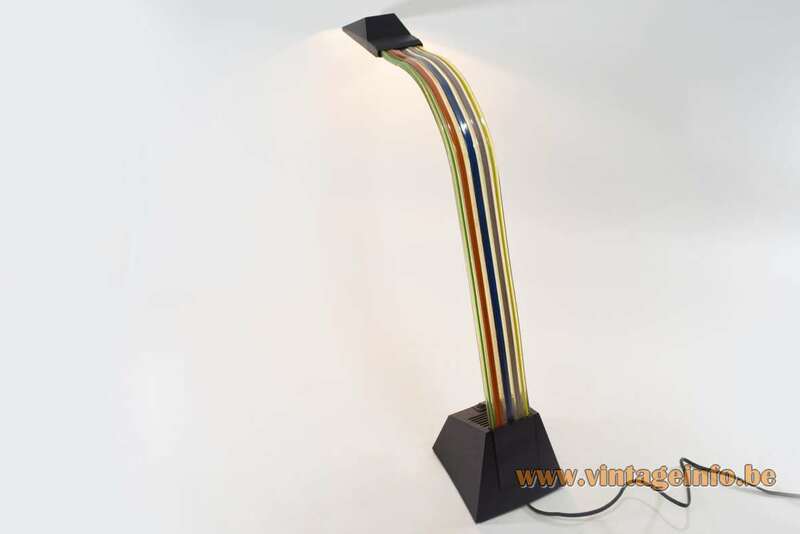 When used at 110 volts, it is recommended to buy a 6 volt halogen lamp. Designers: Alberto Fraser in 1984. Other versions: Also made in blue. 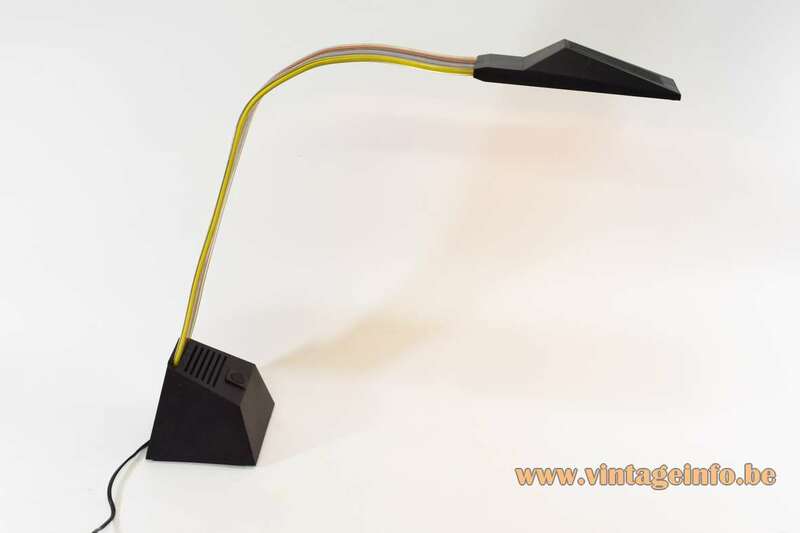 In 1985 a clamp desk lamp was made. Nastro is the Italian word for ribbon. It refers to the flexible pliable arm that looks like a fly curtain. Alberto Fraser was born and raised in Glasgow, Scotland. Glasgow is a port city on the River Clyde in Scotland’s western Lowlands. Fraser is the son of an Italian mother and a Scottish father. He studied both Architecture and Industrial Design in the Rhode Island School of Design (1977-1984). The subject of lighting has always been a feature in his professional career. For over twenty years he has lived in Milan where he works for companies in different sectors with a strong propensity for technological innovation. His company was named “Design Works“, today (2018) named FraserDesign. He runs it together with his daughter Patricia. Alberto Fraser is the author of the project Ribbon for Lumen Center Italia. 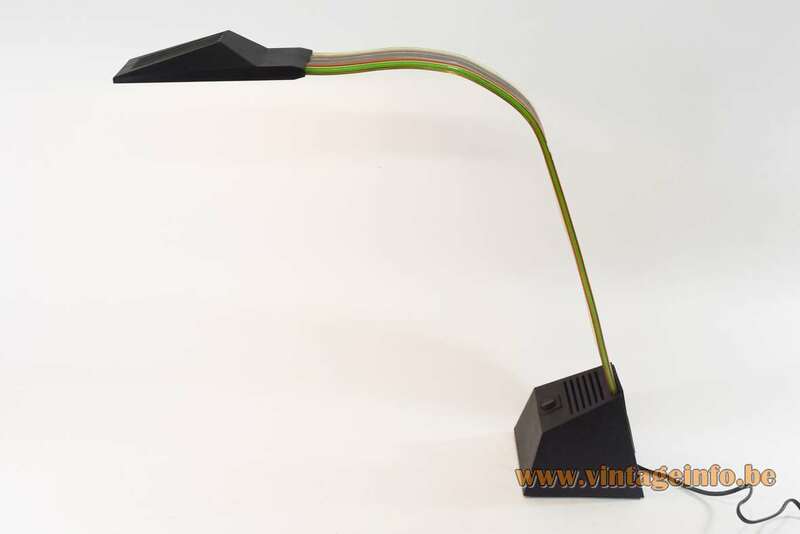 The Ribbon LED lamps are made in the same way as the Nastro; with a ribbon. The were in production since 2007 for several years. 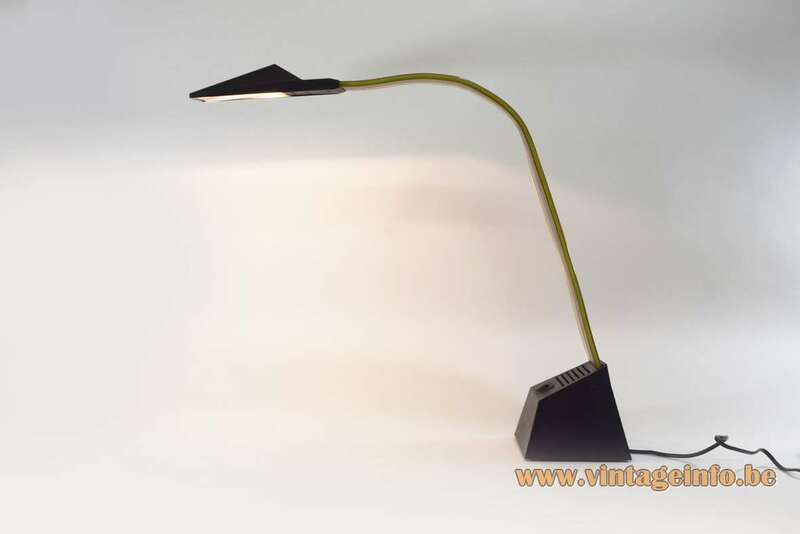 Stilnovo worked with a large number of leading designers, including Gaetano Sciolari, Joe Colombo, Gae Aulenti, Alberto Fraser, Ettore Sottsass, Danilo & Corrado Aroldi. Cini Boeri, Jonathan De Pas, Donato D’Urbino, Paolo Lomazzi, Antonio Macchi Cassia, Roberto Beretta and so on. The company ended business in 1988. All the electric parts are made by VLM Components. The company was founded in 1945 in Buccinasco, a small village near Milan, Italy. 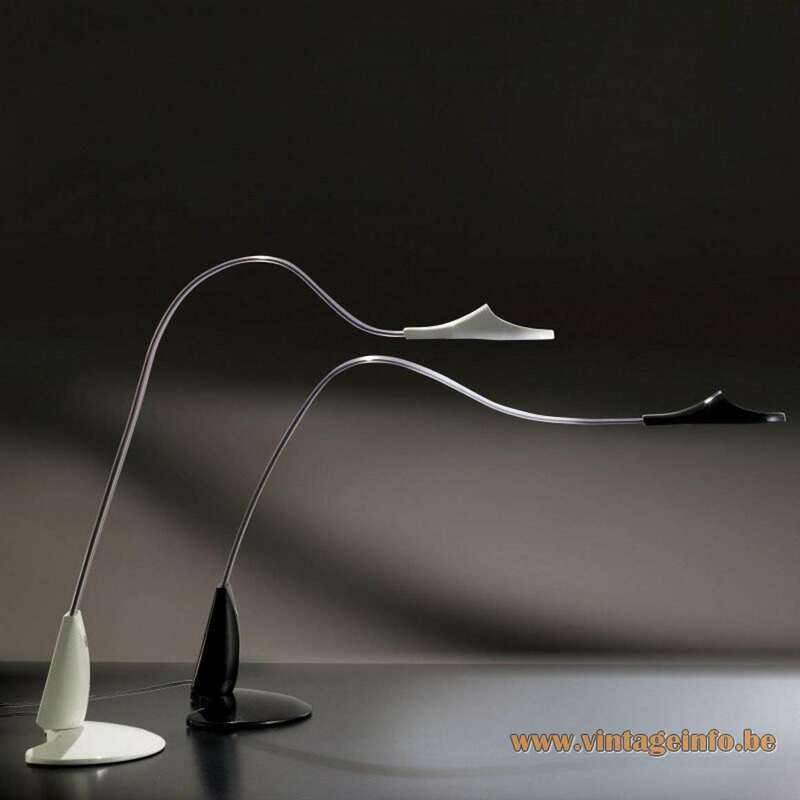 The company became famous for the switches they produce since 1968, designed by Achille Castiglioni. You can find them over here. VLM is part of the Relco Group, founded in 1967. Today they are the owners of the brands Relco, Leuci, Relco Lighting, VLM and Segno.